Arcadia Quest is an exciting new adventure board game for 2 to 4 players created by a quartet of designers, including Mr. Eric Lang. Each player controls a Guild of 3 Heroes, competing to be the liberators of the city of Arcadia and, more importantly, to become the richest and most powerful Guild in the land! 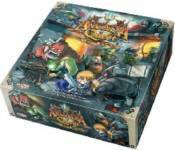 Arcadia Quest is a game that combines PvE and PvP gameplay, as players battle not only the monsters that populate the board, but also the heroes controlled by other players. The monsters react to the players� actions, so there is no need for one player to be stuck with the role of �game master�, everybody gets to play as heroes. The game is played through the multiple scenarios that make up a campaign. Players can choose the path their campaign takes, ensuring that no two playthroughs are ever the same. As their heroes defeat enemies and accomplish quests, they get new weapons, loot and abilities that will make them gradually more powerful and resourceful! - No Game Master, everyone gets to play the Heroes! - Play with 3 Heroes as they fill their boots with monster Gold! - Modular campaign system � Multiple linked scenarios will eventually see the Guilds reclaiming the city of Arcadia. - Level Up and customize your Guild between scenarios with Loot and Equipment!